Find all information about the program, the place and more by scrolling down. For any questions or booking please do not hesitate to write to info@yogalisa.de or the contact us through the form below. The seminars are held in German and English- depending the group. This seminar is facilitated by Alisa and Elisabeth (see team below). Most of the seminars are featuring a guest artist, that is announced shortly before the retreat. The circles will be held in German and English (if needed).Each seminar is very different, since it is also a co-creation depending on what each women brings into it. Again we will go on a cultural journey into different moon philosophies and practices. Each weekend Retreat has one 3 hour workshop. Find the respective topics and descriptions below. Some of the women participating might already be experienced meditation practitioners while others maybe new to it. Meditation is one of the key techniques that not only can lead into a healthy relationship to ones own body and mind but can also be a practice to stay present and be aware of inner and outer cycles. 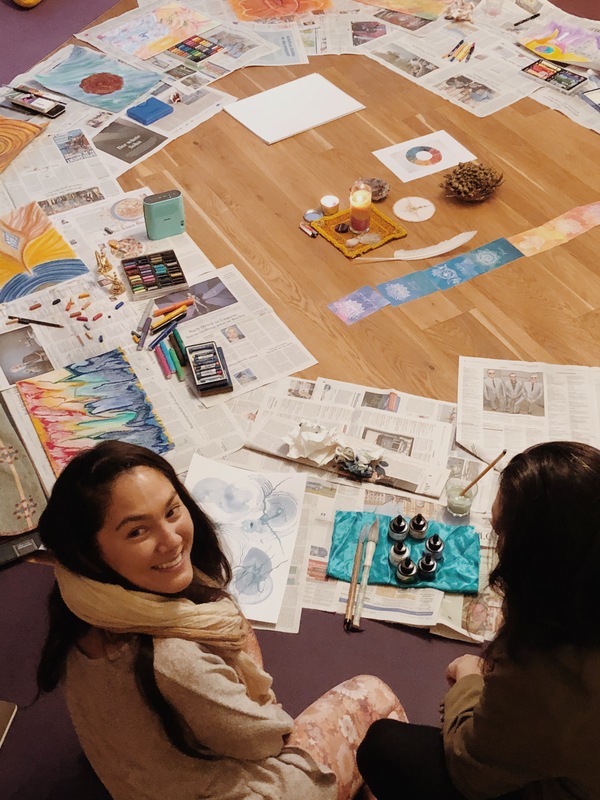 This Full Moon Retreat is not only showing different particular meditation techniques but also giving the opportunity to deepen the capacity to stay present and within this presence to strengthen the perception of subtle energies and help to see the “invisble”. 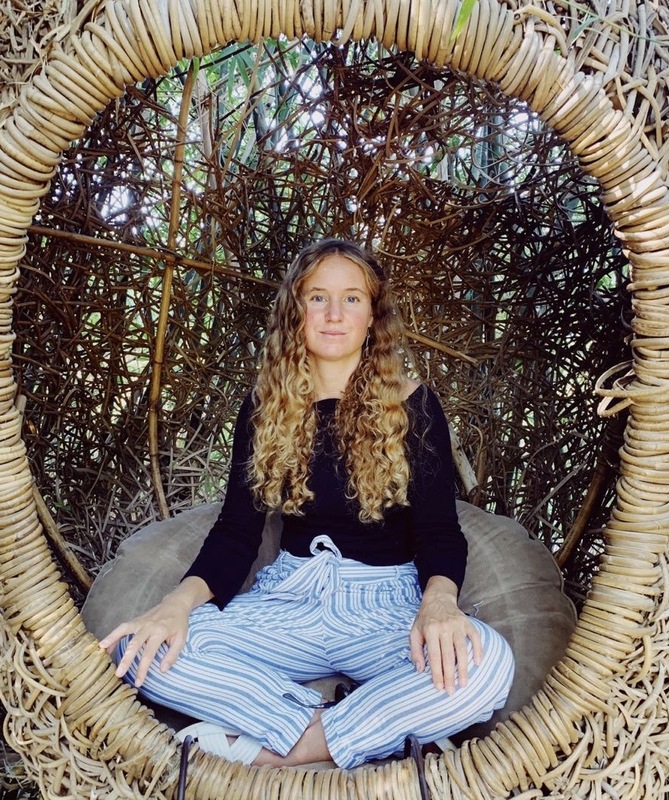 We have the unique chance to enjoy a guided Cacao Meditation, led by the South African artist Caroline Mackintosh, during this Retreat. She will bring her instruments and vision to this session and not only serve us medicinal Cacao, but also guide us through a sonic and meditative journey. Read more about her below in the “Team” section. The Full Moon Retreats invite you to daily Yoga and Meditation practice. This weekend however is dedicated to Movement and Expression through Embodiment. It is also happening in the peak of summer which will invite us to set up our circle next to the Marble Palace right at the Lake called “Heiliger See” (Sacred Lake), which is walking distance from the house. 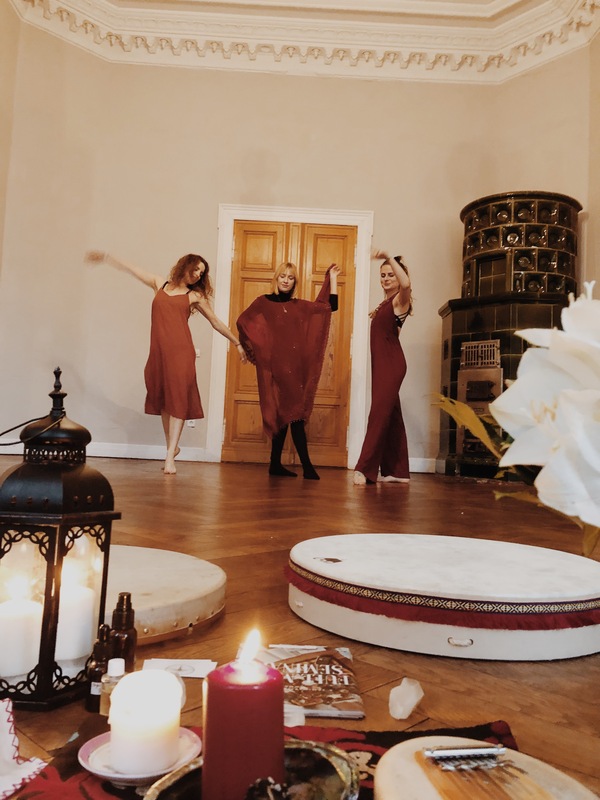 The Workshop brings together the sharing and connecting potential of Women´s Circle with dance and meditative movement. Let yourself be guided by the Circle and by your intuitive forces. Like last year we will work with Color and Meditation and go into a Meditative Painting Workshop with music and dance. It is a new format but doesn´t need former attendance. You can work with pastel or water color. An introduction into Color theory and how it can affect us will lead into the practical part of the Workshop. After the visionary expression through color we will bring it into lyrics and integrate this experience in a poetic form of sharing. It is open to all woman and not about aesthetic painting or writing, but about the process we are opening ourselves to. Alisa has been studying the Art of Ritualistic Performance but also ritualistic structuralism the past years at Humboldt-University of Berlin. The focus of these studies have been the natural cycles of the moon in the past years. 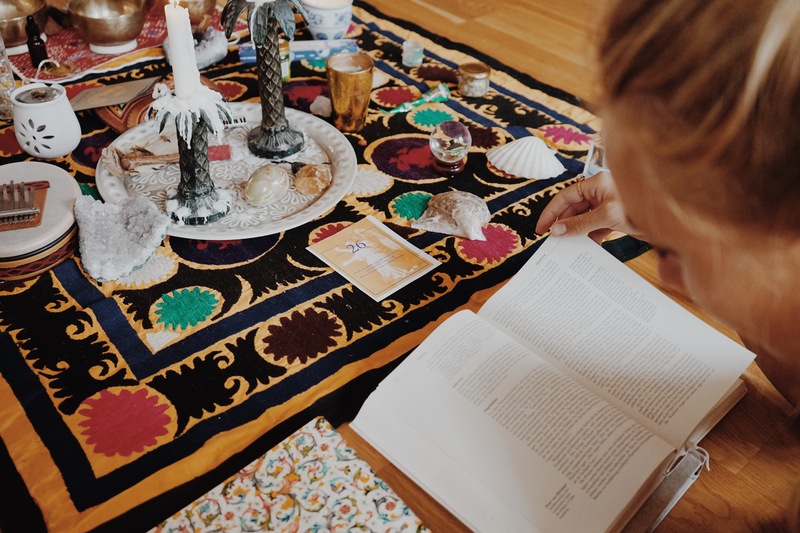 In this workshop we will go deeper into ritualistic realms- after an academic introduction that offers a wider and deeper understanding of the power of rituals, we will experience and share our own rituals that we create together. Before the retreat starts you will get information about it, so you can prepare yourself. 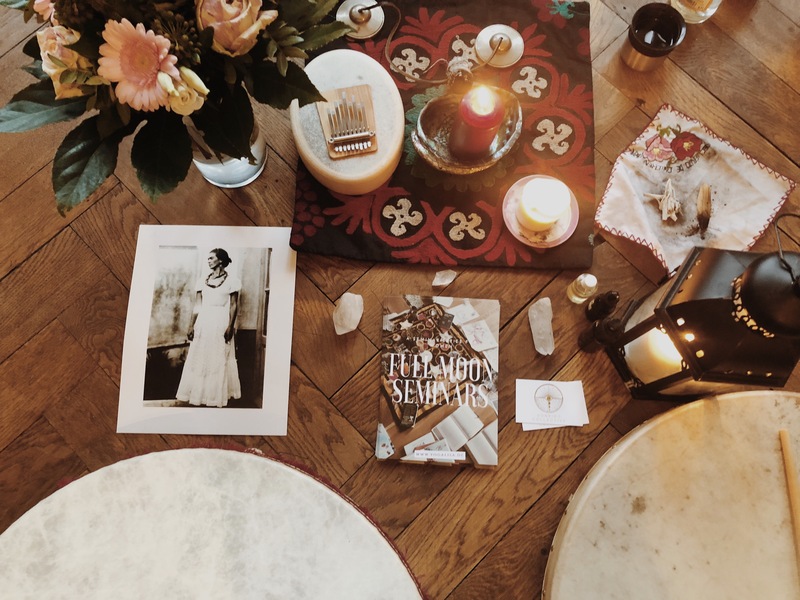 The key is to experience the transformative and performative power of Rituals and also to take inspiration home to cultivate your own practice. This weekend Retreat focuses on integrating the experiences of this year and honoring the season of reflection and looking inwards. The core team is created by Alisa and Elisabeth, who have facilitated more than 6 retreats together. Almost each retreat features an other invited artist, who is announced in the preparation mail or via Instagram. Alisa is a Berlin based artist, writer and yoga- and meditation teacher and degreed cultural-scientist. Always interested in the human mind and its expression in different cosmovisions Alisa studied Latin American Studies, Literature and Theater in Mexico City (UNAM) and history in Berlin. She is currently researching about shamanistic practices at Humboldt-University Berlin to finish her master degree in cultural science. Her academic background is a strong influence providing profound content in all of her workshops. A will to create something truly mind opening brings together her diverse interests and therefore invites to experience the connection between science, art and consciousness. 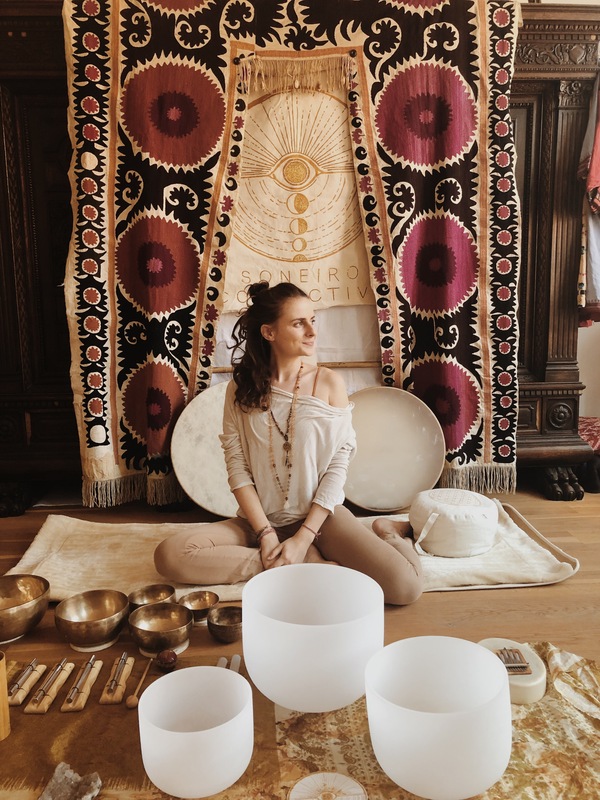 Alisa is hosting since 2016 international Women´s Circles and is hosting the Full Moon Seminars since 2017- which has gathered over 100 women in regular weekend retreats. Elisabeth is a studied psychologist and has worked for established companies in Human Resources. As a project manager she organizes several events and collaborations, in addition to her management of a Berlin based art gallery. She is often travelling around the world and in nature, experiencing different cultures. With her theoretical knowledge and her business experiences she is a media content creator for Soneiro’s Newsletter, Webpage, Event planning, etc. She is also a vital part of the team at retreats and events, holding space and being a guardian of sacred space. Caroline is a South African born Artist living in Berlin. After finishing her studies she started expanding her horizons in various energetic healing modalities such as Voice healing and Sound Meditation and completed her Reiki teachings. Inspired by the natural world, she loves to work between the realms of imagery and Sound, her main mediums being photography, film visuals and music. She focusses on the discovering our connectivity through nature, capturing the essence of being and experiencing. Her dreamscape aesthetic shows the spontaneous need for the raw, wild and free in this world. Caroline will be hosting a Cacao Meditation in the Presence + Meditation Full moon seminar. Cacao is a beautiful medicine, it’s powerful, yet gentle and soothing on the heart. The Spirit of Cacao is a teacher, a keeper of ancient, sacred wisdom, when one meditates with it, cacao really allows one to work with the heart Chakra. Caroline will be using intention setting, guided meditation and a sound journey, so we can dive deeper into our bodies, hearts and minds. Before each Seminar starts you will receive a message with a view questions to reflect upon and that prepares you for the weekend. In 2017/2018 several women went through the whole seminar series (3 dates) which is a very enriching experience. We recommend to take part in several seminars. However, you can also book only one or two dates. If you take part in more than one you have the chance to go deeper into the topic and observe your own development within this time. * if you really want to join but can´t afford it, you can contact us, there is the option to get a reduced price for students, low incomes and women with children. – Dinner Friday Night. Breakfast and Dinner on Saturday. Breakfast Sunday (all fresh and vegan). 2.2 Der Restbetrag des Gesamtreisepreises ist spätestens 30 Tage vor Reisebeginn-(maβgeblich ist der Eingang der Zahlung bei dem Veranstalter) fällig. Wurden die fällige Anzahlung oder der fällige Gesamtpreis nicht oder nicht vollständig bezahlt, obgleich der Teilnehmer die Aufforderung erhalten hat, kann der Veranstalter nach erfolgloser Mahnung und angemessener Fristsetzung zur Zahlung vom Vertrag zurücktreten (§ 323 BGB) und den Teilnehmer mit Rücktrittskosten von 30% der Reisekosten belasten. Nehmen Sie einzelne Retreatleistungen, die Ihnen ordnungsgemäβ angeboten wurden, infolge vorzeitiger Rückreise, wegen Krankheit oder aus anderen Gründen, die von Ihnen zu vertreten sind, nicht in Anspruch, so besteht kein Anspruch Ihrerseits auf anteilige Rückerstattung.